Along with their charming ambiance, fireplaces are a great way to keep your home warm while decreasing your utility bill. Before you light a fire, there are a few things that you need to do to make sure it is safe for use. Fireplaces can be the source of house fires, so it’s important to prepare your fireplace before using it. Be sure to sweep your fireplace before using it when the weather turns cold. Sweeping it once a year eliminates soot and debris, making it safe to use. Prepare your fireplace for use by searching for damage. Check the structure of your chimney and the lining for cracks, deterioration, and loose bricks and mortar that may be missing. If you spot anything broken, lose or missing, then make repairs or replace the materials. If these elements aren’t in good working condition, then your fire may receive too much oxygen and become a fire hazard. Check the gasket to confirm that it is sealing the fireplace door and the ash dump. When the gasket isn’t working properly, it can result in too much oxygen for your fire. If your fireplace was installed with a blower, then be sure to clean it before lighting the season’s first fire. In most cases, fireplaces don’t come with a filter. This means that you’ll need to clean the blower to prevent debris build-up. Make sure that the chimney is capped properly. Doing so keeps critters like birds, squirrels, and mice from making their way inside. Capping also prevents rain, leaves, and any other debris from entering the chimney. If the cap is damaged or missing, then replace it. To regulate the air flow within a chimney, a damper, which is a plate or a valve, is required. Before using a fireplace to heat your home, make sure that the damper is working as it should. If you notice anything unusual about your fireplace such as an odor or strange draft, bring in a professional chimney sweep or home inspector. He or she will be able to determine what’s causing the problem and recommend a fix. 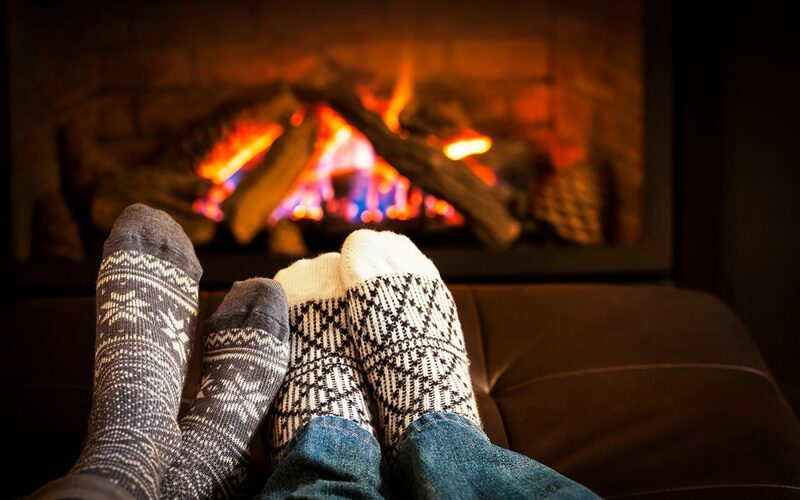 When you start using your fireplace, check the smoke and carbon monoxide detectors in your home to make sure that the batteries are powering them properly. Replace any batteries that aren’t working. Also, test your alarms. Once you’ve readied your fireplace, use the right firewood in it. You’ll want to burn dense wood that’s seasoned like oak. For an indoor fireplace, be sure to use wood that’s split and has been stored in a dry area for a minimum of six months. If you’re splitting your own wood, make sure to cut it down to the right size. Place logs toward the rear of your fireplace. Start with kindling, and then add a few more logs. Use a spark guard to prevent embers from flying out of the fireplace and move any flammable items away from it. To circulate air, operate your ceiling fans clockwise. Fireplaces offer benefits like heat, a nice smell, and flickering, cozy light. When you prepare your fireplace properly, you’ll have an affordable and safe way to stay warm. Appalachian Inspection Services serves Western North Carolina with home inspection services including home maintenance inspections. Contact us to book an appointment.